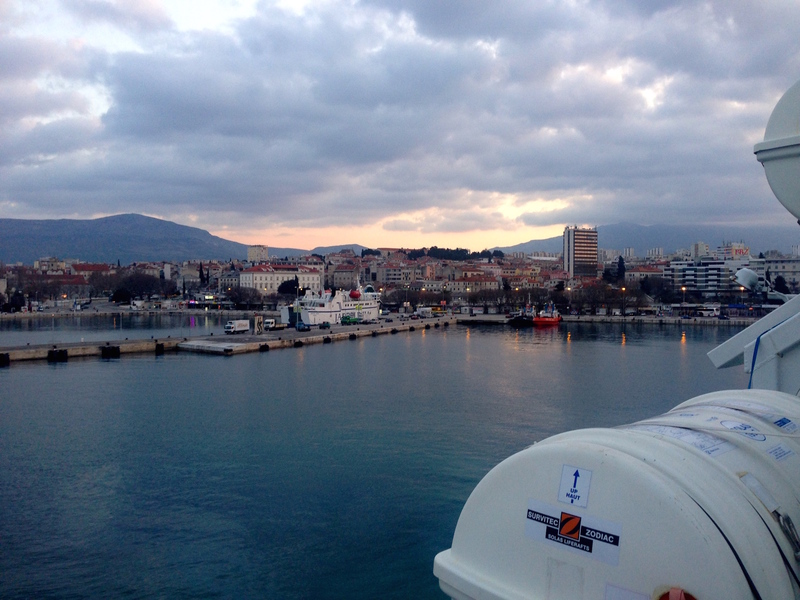 The view from our Jadrolinija Ferry as we came into port in Split, Croatia. One thing I’ve been repeatedly annoyed with during our year abroad is the total lack of helpful information online. We’ve come to be VERY spoiled in Seattle, where everyone seems to have a stellar website created by a brother or cousin or friend who is a web designer. In a lot of countries we’ve visited, businesses just don’t have websites. When they do, visiting them is like time traveling back into the 1990s, the time of Geocities and animated gifs and purple fonts. Again and again, the most helpful information we’ve been able to find comes from blog posts written by other travelers. Beautiful Split as we arrived at 7 in the morning. When it came to taking an overnight ferry from Italy to Croatia, I was predictably disappointed in the information the interwebs had to offer. I spent hours and hours searching the internet to try to figure out what to expect. Did we need to book a cabin or can you sleep in common areas? Is it acceptable to bring food onboard with you? Are sharp items forbidden from baggage? Is there a limited liquids rule? How early do we need to arrive? Where do we go to check in? Can you buy food onboard the ferry during the 11-hour trip? 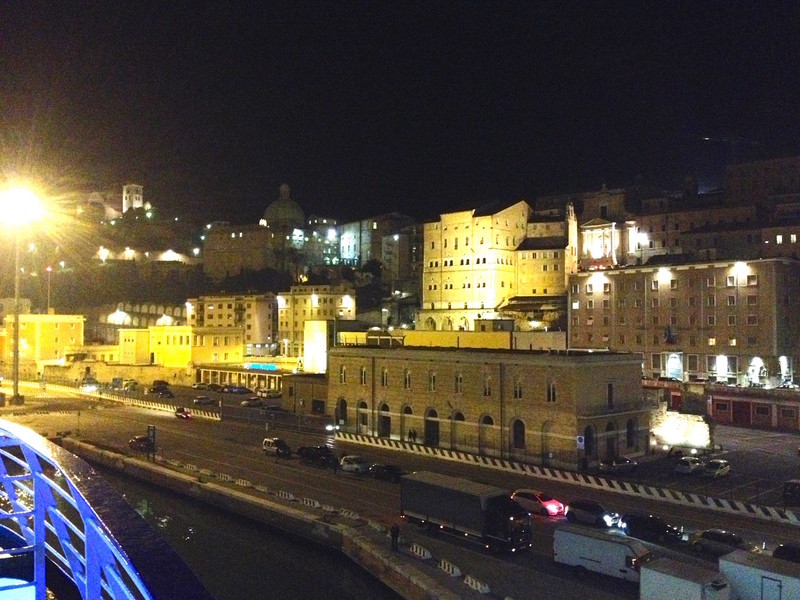 Ancona, Italy at Night before we left Port. 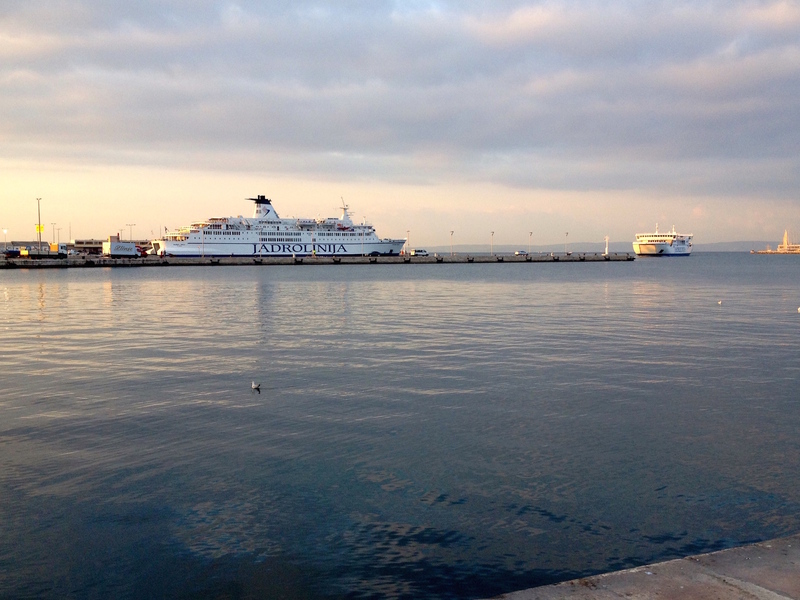 Taking the Jadrolinija Ferry from Ancona to Split was every bit the adventure we hoped it’d be. There was an all-men’s Croatian choir. There were surly Italian and Croatian truck drivers (first and foremost, it is a car ferry), there was a run-down interior that made me feel like we had teleported to Atlantic City circa 1980. Since we were armed with sleeping pills, booked an actual cabin, and brought a bunch of snacks onboard, it was definitely not the nightmare ferry crossing I had feared. In fact, it was pretty fun and I’d do it again. 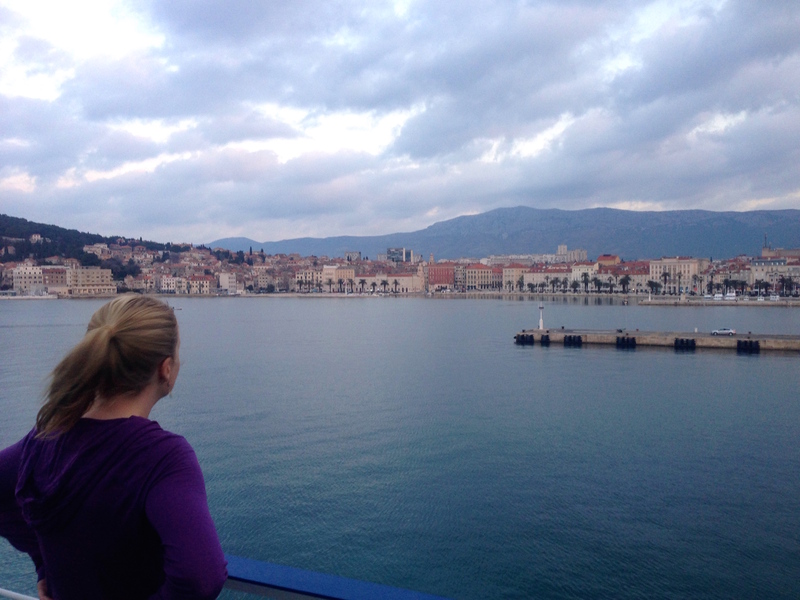 To try to help other travelers, and to show our blog readers what shenanigans we got into during the ferry crossing, we put together answers to some of the questions we had before taking the Jadrolinija Ferry from Ancona, Italy to Split, Croatia. Is It Ok to Bring Booze (and Food) with You? Absolutely! In fact, you’d be the odd person out if you didn’t bring at least a liter of wine with you. We only brought two tiny 200mL bottles of red wine along. We might have been the only sober people onboard, except for a 10-year-old girl and (hopefully) the boat captain. (PRO TIP: Bring your own cups unless you’re cool drinking straight from the bottle. Hey, I don’t judge.) Most of the Italians and Croatians who clearly take the overnight ferry all the time brought coolers FULL of food and booze. Bring Your Own Wine! Yes!! There is some food available for purchase onboard. 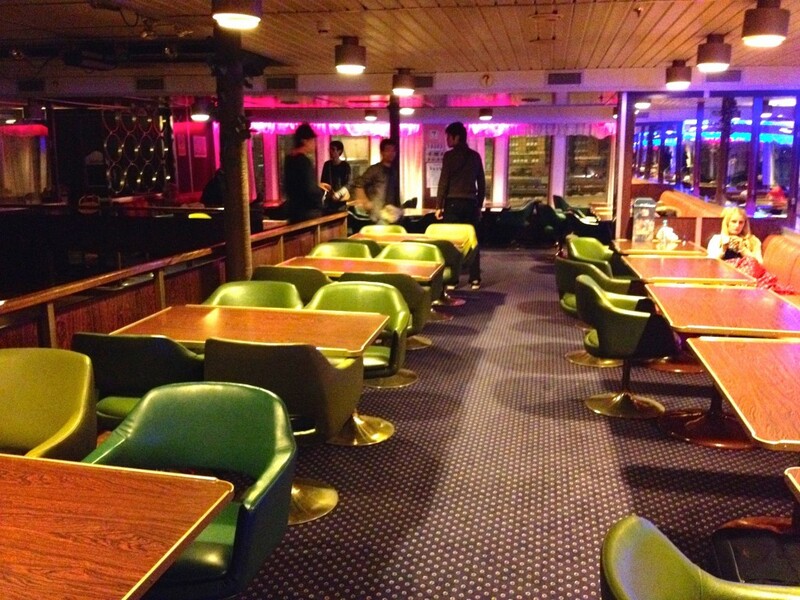 You can have a full-on sit down dinner in the fancy onboard restaurant. (Note: all it takes to qualify as “fancy” with me is the use of white tablecloths.) The restaurant prices were very reasonable, especially for a “cruise”. I use the word “cruise” loosely. There’s also a snack bar area where you can buy snacks, beer, wine and non-alcoholic drinks. The one thing you should bring plenty of is WATER. It’s overpriced onboard, and I wouldn’t trust what comes from the tap in the bathrooms with my life. Is There Entertainment Onboard, Like a Normal Cruise? Exploring the Boat to entertain ourselves. The short answer? No, unless you count people watching as entertainment. We traveled in February, the lowest of lows as far as tourist season goes. What looked like it might be a duty free shopping area was a total ghost town. There was a dance floor in the lounge area, but like I said, we had less than a half liter of wine on us. It takes more than that for me to start my own dance party. The Dance Floor! Conveniently located next to the children’s play area, because that makes perfect sense. We happened to win the cruise lottery, though, and ended up on the ferry that was transporting one of Croatia’s finest all-men’s a capella choirs! I’m not sure Kevin and I have ever been on a boat together without encountering some sort of musical group. 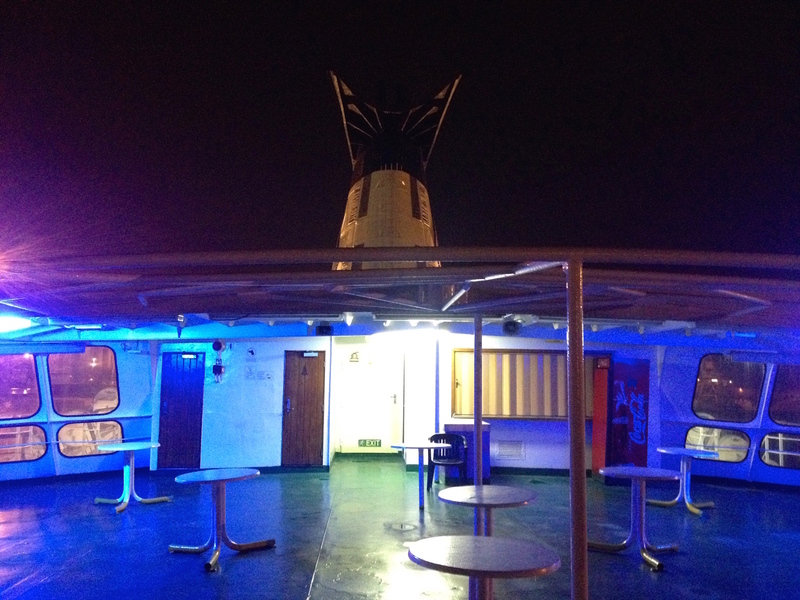 In Germany, we ended up on a Rhine River ferry boat with a full-on Oktoberfest Oom-pah band! The outdoor “cocktail area” on the back of our Ferry. Back to the Croatians though. Having them on our boat was everything I hoped it would be, and more. They belted out tunes with abandon for over a half hour before the boat disembarked. And when I say they belted it, they really belted it. One of the gals who worked on the ferry boat even stood with us and translated the Croatian lyrics for us! Most of the songs were fisherman’s tunes traditional to Croatia, about things like missing your wife and family while you’re at sea. Some were about lost love or lost friends. We fell asleep to the rumble of the boat engines and the sound of the choir singing in the lounge after they had their dinner. It was really a special part of the cruise. Should I Book a Cabin? That depends on you. Do you like roughing it? Can you sleep even when there are lights on? Are you traveling with a pillow and blankets? Do you feel comfortable sleeping on a hard, semi-dirty carpeted floor next to a man who smells like prosciutto? If you answered yes to all of those questions, then just book the cheapest passage possible – a “Deck” seat. “Deck” doesn’t mean you’ll be sleeping outside. It just means you have to hunker down and sleep in the boat’s common areas – the lounge, the chapel, the children’s play area, the dance floor. MOST people who seemed like ferry regulars seemed to have just Deck tickets, and they made themselves at home in the lounge. 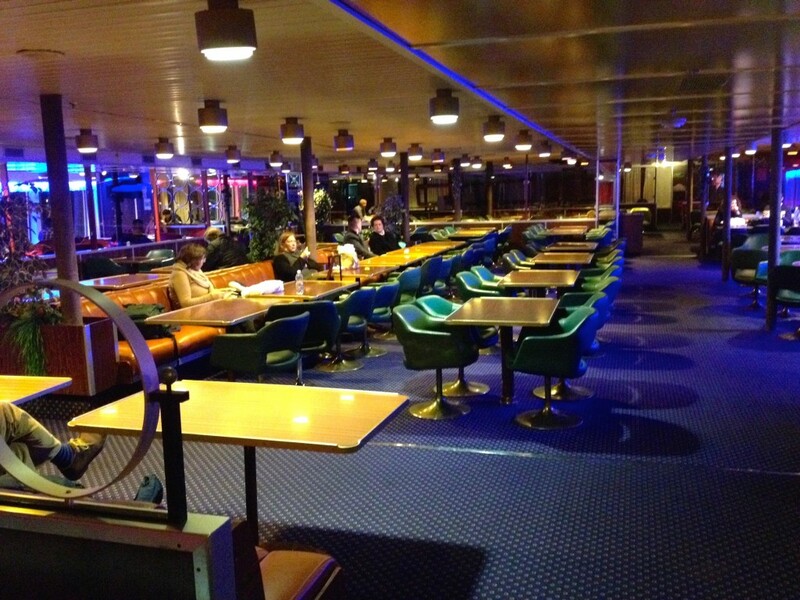 The Lounge on our Jadrolinija Ferry, the “Marko Polo”. 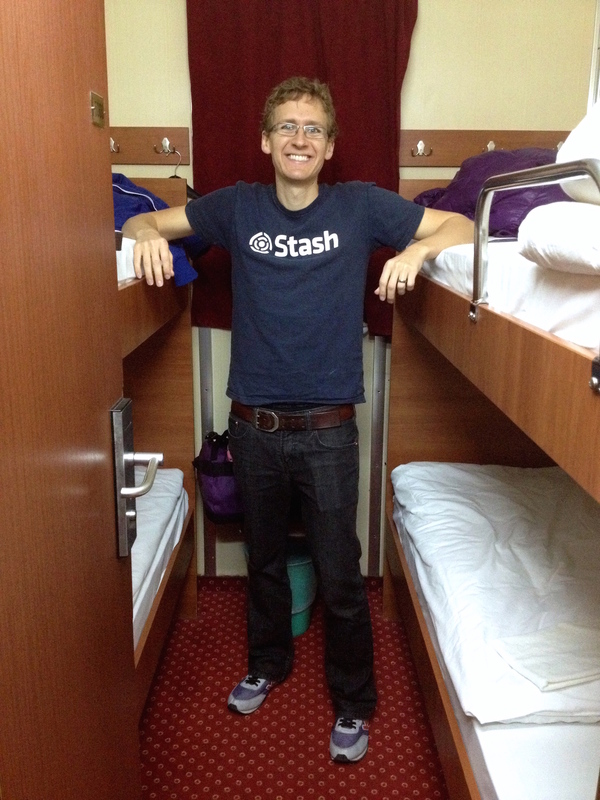 We booked the cheapest cabin, a couchette, and were SO glad we did. We’re traveling pretty light, so we don’t have things like blankets or pillows to make a deck ticket do-able. It was also nice to be able to lock our bags in our room and explore the boat without all our stuff. Also, I think there is a time and a place for the smell of prosciutto. Two in the morning is not the time. 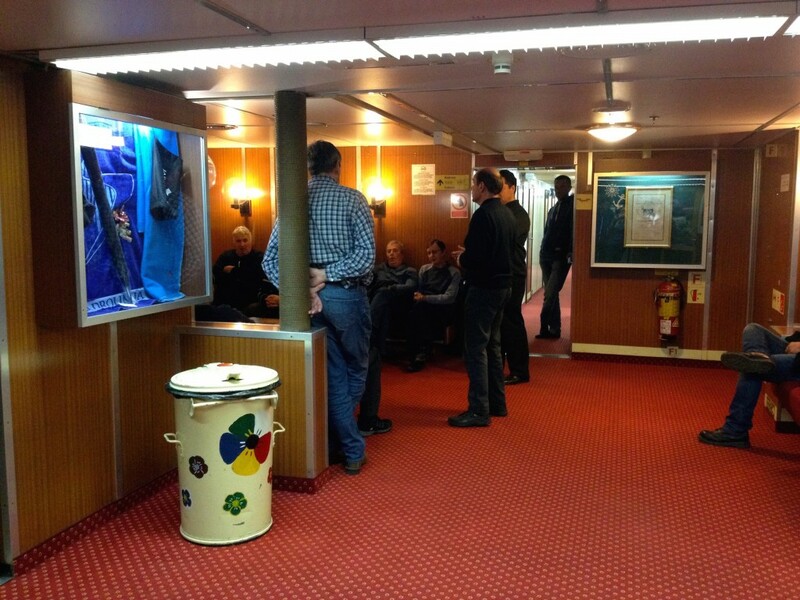 Ferry Veterans, hunkering down for a night in the lounge. Our simple couchette cabin didn’t have a sink or bathroom, it was just a room with four bunks which we had all to ourselves. We were just down the hallway from a shared bathroom that was a bit rustic, but not a nightmare. Added bonus? If you book a cabin you get free breakfast onboard in the restaurant! 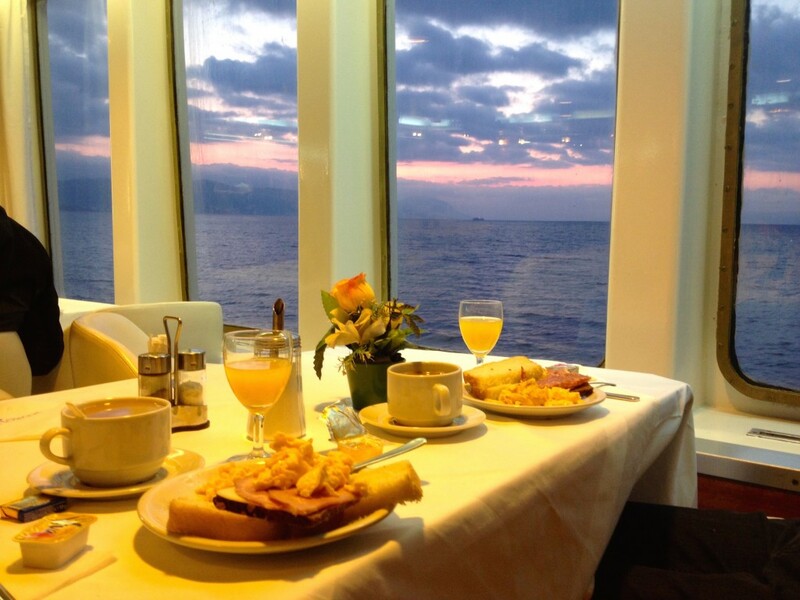 Sunrise Breakfast – Complimentary with Cabin Purchase! Seat tickets are also available, but literally NO ONE had one of these on our ferry. 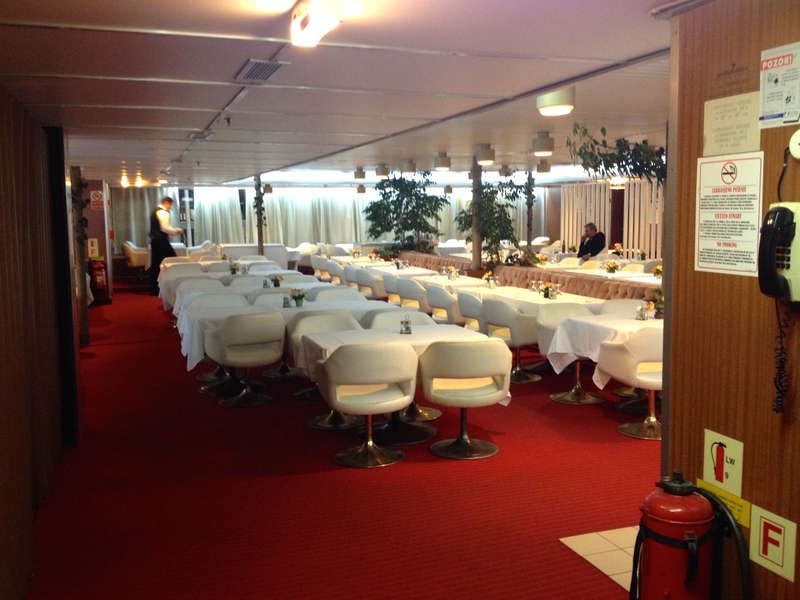 The seat room is a brightly lit room full of tightly packed seats that recline slightly. I do not recommend this option. Our Couchette Cabin. Small but Mighty. 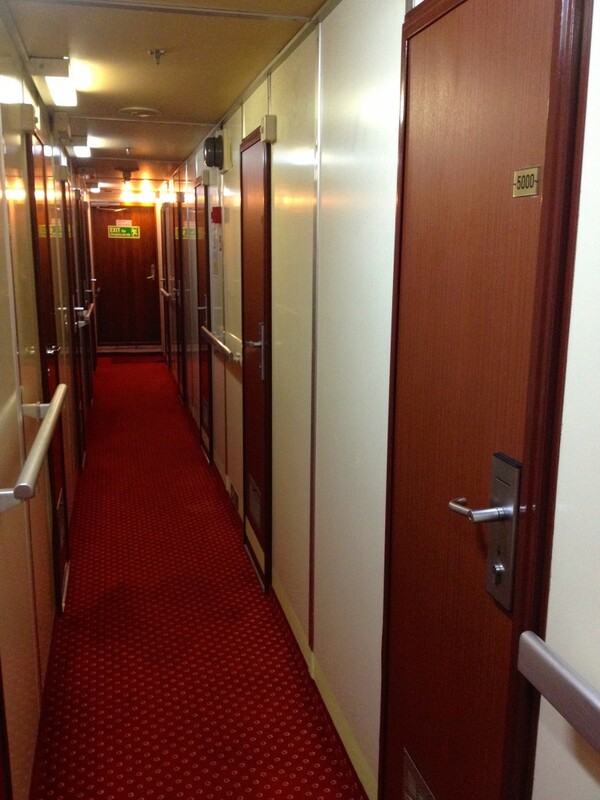 Cabins on a Jadrolinija Ferry. Moderately comfortable. To book tickets, do it ahead of time directly with Jadrolinija. So What Is the Price Breakdown? First, everyone pays a bare Per Person Fee called “passenger taxes” (You pay this no matter what accommodations you book) of 114 HRK (about $16). 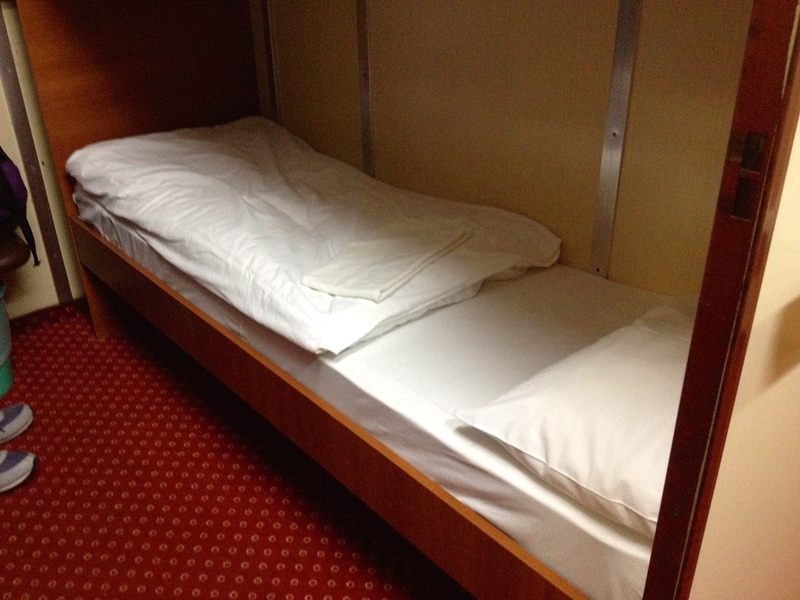 The couchette ended up being most cost effective for us. So the total fare for Kevin and I for the Ancona to Split ferry was 2*114 HRK for Passenger Taxes plus 2*540 HRK for our private couchette cabin, which came out to a grand total of 1308 HRK, or about $187. Not bad when you consider it was an 11-hour journey with beds to sleep in and breakfast included. It sure beat the cost of flying! Can I Bring Liquids or Sharp Objects Onboard? 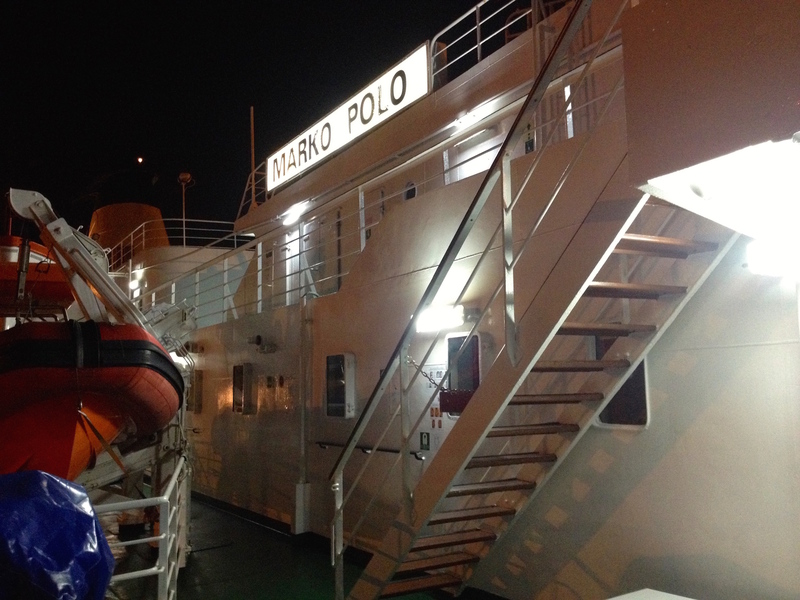 Our Boat, the Marko Polo. We saw so many things onboard that made us do a double take. One man had a huge butcher’s knife to prepare his dinner in the lounge. Another group had a full sized rolling cooler with drinks and dinner supplies. Another group brought a couple big chocolate cakes onboard with them. One guy had a handle of vodka. Within reason, you can bring anything your heart desires onto the Jadrolinija ferry. I prrrrobably could’ve smuggled Kevin onboard in a big suitcase to save money. But we’re not quite THAT cheap… Yet. Where and How Do I Check In? Jadrolinija Ferries, where you board by just walking on via the car ramp and roaming around until you find the right stairwell. Very organized. Day drinking outside the Jadrolinija Ferry Check-in Building. UPDATE 2/21/2018: I fixed the map! Unfortunately, it has been several years since we’ve been in Ancona, so I don’t know any longer if this is accurate. Please leave me a comment to let me know! Arrive more than 2 hours early! Do not even think about cutting it close. You want to allow lots of extra time to account for unhelpful employees, slow check-in lines, busses that run infrequently, and last-minute trips to the store to get extra wine. If you arrive by train, you’ll arrive to the main Ancona Train station (the red pin on the map). If it’s raining and the timing lines up, you can connect on a train to the Ancona Maritima station (the blue pin on the map), which is much closer to the main Ferry area. The ferry check-in building is nowhere near the ferry departure point. On the map above, Ferry check-in is at the red star, while the green star is the main ferry area where the ferries dock. At the main ferry area (green star), there is luggage storage (EURO 2/bag) and free bathrooms, and this is where you’ll go through passport control before boarding your boat. There is a FREE BUS that runs every 20 minutes or so between the Check-in Building (Red star) and the Main Ferry Building (Green star). We were glad we used the bus, because I would EASILY get lost in the area around the Check-in building and there are no sidewalks. Passport Control opened 2 hours before our boat departure. Unless you have a deck ticket and want to stake out a nice sleeping spot in the lounge, there’s no rush to board. Take your time exploring Ancona, have some dinner at a local cafe, buy some biscotti from one of the town’s many bakeries, then get on the boat when there’s less than an hour before departure. Once you’re onboard, head to the reception desk to pick up the key to your cabin, and hunker down for the night! 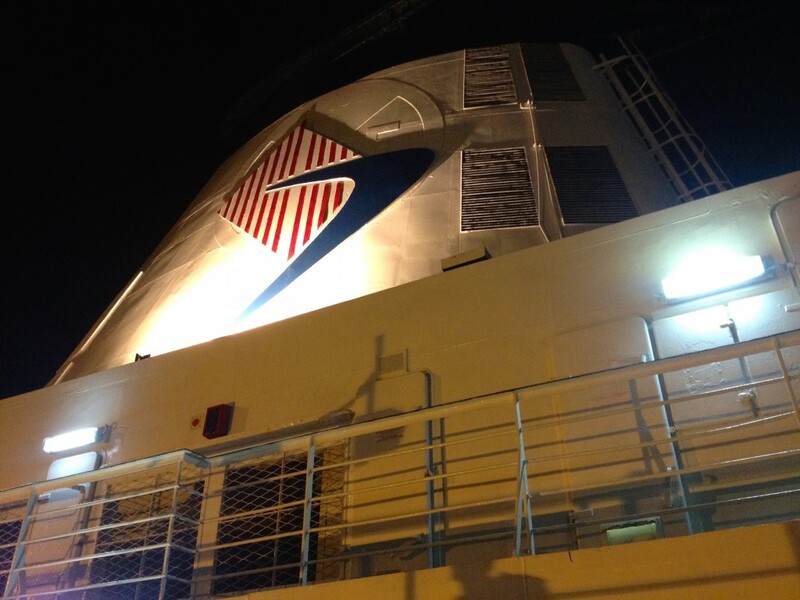 Do you have any interesting cruise stories? 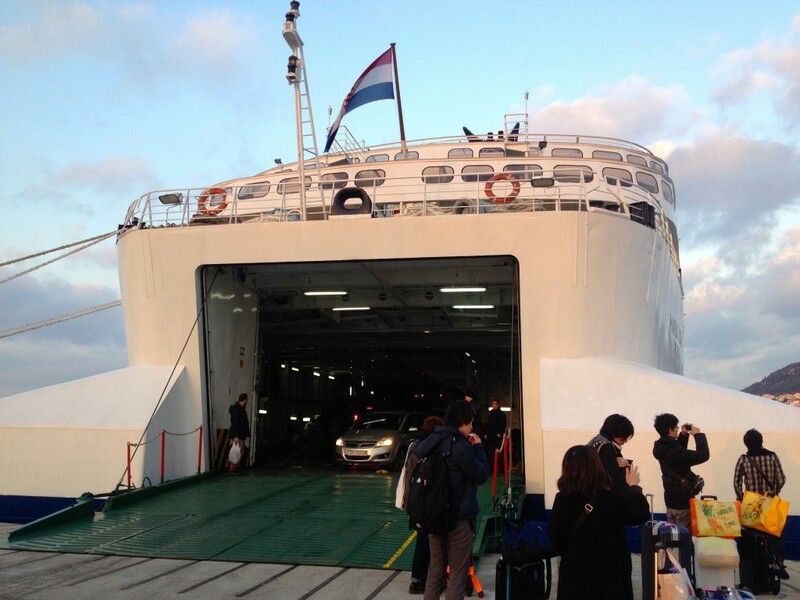 Are you planning to take A Jadrolinija Ferry from Italy to Croatia? Leave us a comment to let us know! Again Mel, Sooooo entertaining!!!!!! 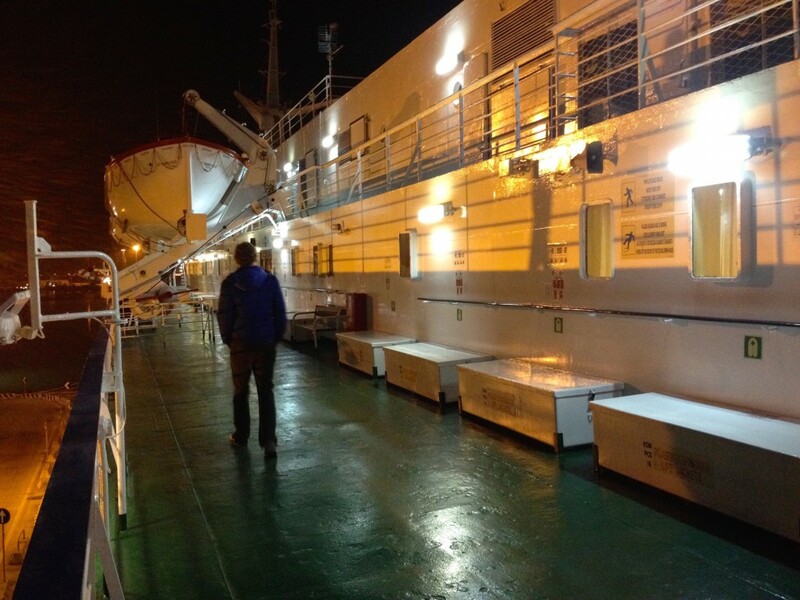 I did take a ferry from England to Ireland (just three hours) and really enjoyed it! Would enjoy your trip, especially with a cabin option!!!!! Thanks for the good advice and info! You really must think a bout publishing all of this when you get home to the U.S.!!! YES – totally the 90s, it’s terrible! I’m so glad that this helped you! I’ll cross my fingers that there happens to be a Croatian Men’s Choir on your ferry too. By the way, if you’re staying in Split, we stayed in a cute little Airbnb that was definitely the nicest apartment we’ve rented in Europe so far. If you’re looking for a place to stay in Split, we definitely recommend this one. And if you haven’t signed up for Airbnb yet, you can get a $25 (or 23 euro) credit if you sign up with my affiliate link! So glad to find your site! My fiancé and I are taking the ferry (deck seats…) tomorrow and did not know what to expect, feeling much more excited about this ferry trip now! I’m so glad you found my post helpful! How was your voyage? I hope it wasn’t too bad – I’d actually be super curious to hear how the Deck Seats were during high season since our voyage was in February. Super helpful — taking the family and car across in a couple of weeks. Thank you! Very helpful. Doing the trip in June but in the other direction Split to Ancona. Thank you! Thanks for writing this up! I’m having the same issues with finding info, and while I’m going from Split to Ancona in May, I do feel more prepared! I ended up booking the outside room since it was about the same price as couchette when I looked at it, and I am a terrible sleeper. You are a life-saver!! Thank you so much for writing you experience. 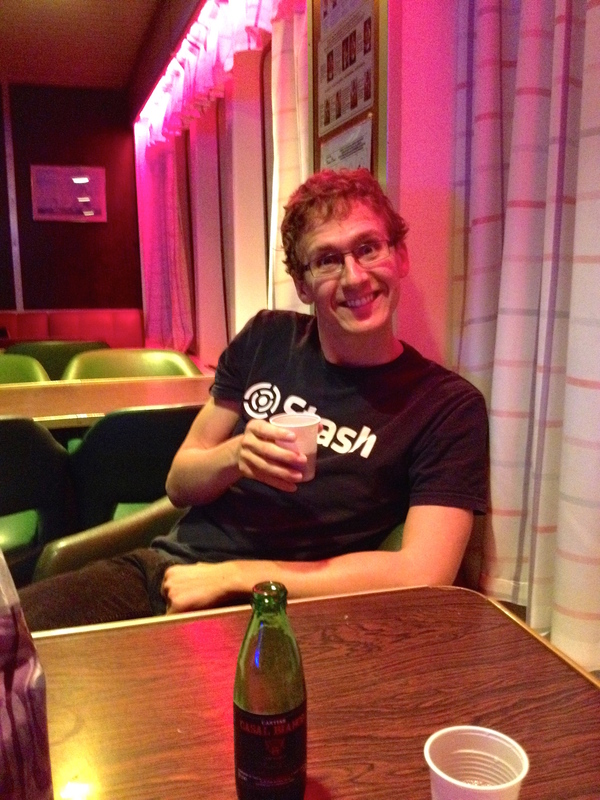 I’ve done the overnight ferry on the “deck” but it was in Denmark, so it was pretty nice, and with a large group. This is crazy question, but did you happen to see any gluten free options for food on board? 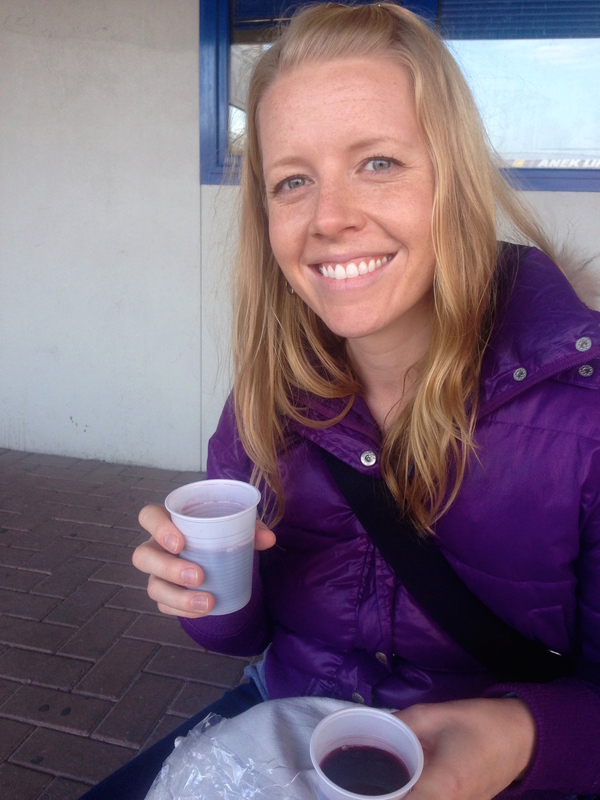 I have Celiac… Thank you again! I would not rely on them to have gluten free options onboard for you. Since it was low season, the only thing that was really open was a “snack bar” with a few really processed food options. The best you’d probably be able to do onboard is a hunk of cheese and a bottle of wine. Which kind of sounds like a party, but you might want to purchase and bring aboard something a bit more balanced. Thanks for the post – like the other commenters – I’ve been searching for information for a little while now. Nice to see picture and hear experiences. I’m travelling in July so am going to for sure get a cabin. I’m about to make that journey tomorrow, after first traveling by train from Rome to Ancona, so this was VERY helpful, thanks!! I have one question that I couldn’t see the answer to in your post. How do you get from the train station to the check-in area? I have one very heavy suitcase that I don’t want to have to drag around any further than i have to. Thanks!! Hi Jane! I know my response is too late to help (I’ve been on a blog break after having a baby), but here’s some info I hope will help other readers. If I recall correctly, you can transfer at the main Ancona train station where you’ll likely arrive, and take a train to the Ancona Maritima station which is much closer to the ferries. We walked because we love walking, but I know that is not ideal for many travelers. If anyone reading has done this trip recently, please leave a comment if you’ve got more info. Cheers! Congratulations on becoming a mother! It puts traveling challenges into a new perspective, doesn’t it? I hope you are all happy, healthy and making the most of one of life’s extraordinary experience! Mel, Thanks so much for taking the time to share your more recent information about using the Croatian Ferry system. My wife and I will be traveling to Italy in a few weeks and plan on ferrying Ancona-Split. We also have found limited info about the ins and outs and how to’s. You certainly have cleared up a lot of questions. One additional question though ….. in reference to the check in process (your map with red star, blue dot, etc) If you arrive by train (red pin), can you go directly to the ferry check in (red star) and then take the bus to the dock? Hi there Martin! Thanks for your comment, and I’m sorry I am only just now responding. Over a year later! I had a baby in 2016 and have ignored my blog since then. How was your travel, and your check in process? Is it the same as I described in my post? For other readers knowledge, I’m not sure I would recommend trying to go directly to the ferry check in on foot. If I recall correctly, this wasn’t a very pedestrian friendly area – we were essentially bussed in to a random building in what felt kind of like a ship yard, so it would be easy to get lost. I’d love to know if it’s still this way, though! If anyone can provide more details, please leave a comment. Thank you SO much for this! I took a similar ferry to Greece but want to go from Croatia to Italy next week and since I’ll be solo this info helps so much! From one “Mel” to another…thank you so much for this info. (so glad I found this blog). I have been researching this trip and have been confused on the sleeping arrangements/costs posted on the websites. We are still a long way off from our trip and are planning time in Italy also; therefore, I have been researching many different areas, transportation, accommodations, etc. Our plan is to arrive in Ancona via train from Rome so your explanation as to where everything is located in Ancona was very helpful. You answered so many questions and provided information I haven’t been able to locate online. Great job, thank you!! Have just boarded after a frantic hour of late trains and not understanding the tickets. Train via Bolgna an hour late so cutting it fine anyway. Trentalia tomes, btw, an impossible joke. Had planned departure from Mirano with hours to spare and plans of long lunches and many beers. Did get time to grab a Big Mac in Bologna- which somehow seems blasphemous….But is closest food to station. Bus 20 ahutle is as you explained. But I’ve only read it just now and am sitting on bar deck with the Ozujsko beers lined up…. Beautiful view of Ancona from up here. 4 berth cabin doesn’t have a shower. Worth noting.! 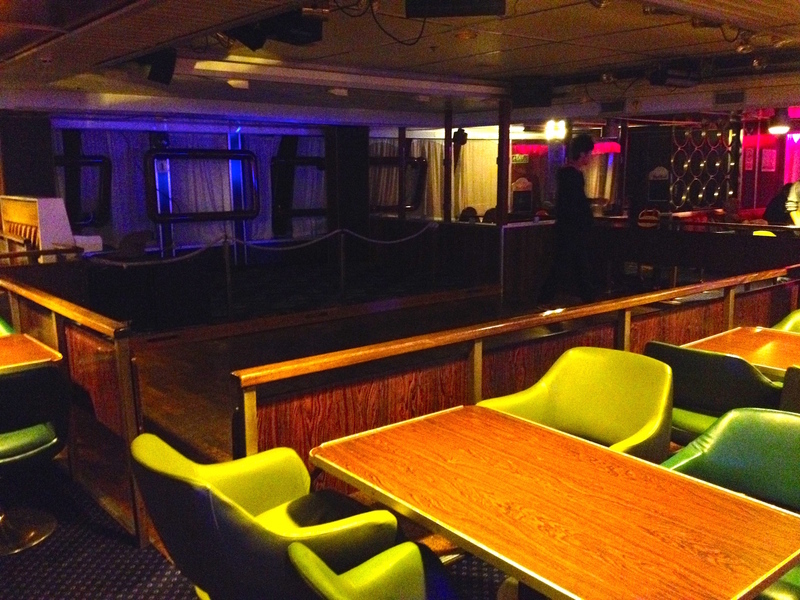 Some experienced travellers have just put up a pop up tent on the rear deck….location and views! Thanks for the info. I am looking to do Split to Ancona in April 2017, and this has given me a few clues as to what to expect. Am hoping I don’t regret it! Melany, thanks for your article. I and my wife will cross to Split tomorrow and I was worried about the check in, but now I am more relax. Thanks for your brilliant article! You saved me so much hassle with regard to check-in and ticket collection. I doubt things would have gone so smoothly if I hadn’t read it in Ancona the night before I sailed. Had a fantastic time. Much appreciated! Thanks so much for this! we’re planning to fly to Split and wanted to take a day or two and go to Italy. This seems like a great way to do that. It covers 2 nights of hotel costs as well as at the same time moves us from point a to b. Thanks again for your tips and sharing your experience. Like you said, it’s hard to find any of this practical information online. When did you take your trip? Hi Andrew! Sorry for a HUGE delay in responding – I’ve been on a blog hiatus. Our trip was in February 2015. I hope you had a nice trip to Italy and Croatia! This is perfect, thank you so much for all this info! Thank you!!!! That is so much great information. We are headed for the Ancona-Split ferry next week and I felt like I didn’t understand the info well enough to book it. Your blog is exactly what I needed. Thank you for taking the time to write about your journey. WHOOHOO! Information! Thank you! We’re getting a cabin with sh/wc but could only get a four berth. I’m assuming we still get it all to ourselves… My husband might get upset if I invite the all men a capella choir in with us Thanks so much for the map too! Question if you have a minute…. Any extra charge for luggage? The husband is taking notes and all he wrote down was “bring LARGE wine….” He’s such a help! I know my response is coming nearly a year after you commented. I’ve been on a blog hiatus after having a family. I hope you had a wonderful trip and enjoyed your passage on the ferry! I don’t think we paid extra for luggage, but it has been years now so I can’t trust my memory very fully! If you have any helpful info on that, I’d love a comment! “Bring LARGE wine…” < — Can’t stop laughing at this. wow, so thankful that i found your blog. I can understand and relate with what you said that nothing in the website tells you how to choose the right accommodation. Luckily i found your blog. Thanks thanks so much, so timely! Anyways, 3 of us are travelling, I am not so comfortable sharing the cabin with someone that we don’t know if 4 has to stay in the cabin. Would you recommend the reclining seats? Thanks again. Hi there Myra! I’m sure my response is too late to be helpful, but I’ll post here just in case it’ll help other travelers! Sorry for the delay – I’ve taken a blog break to start a family. I don’t think I’d recommend the reclining seats. I think that the seats you’re referring to were the ones in a brightly lit room on our boat that barely reclined. I’d rather have a deck ticket and find a nice spot somewhere on the floor to try to catch some sleep. What did you end up booking? Would you recommend it to other travelers? Thanks for that: it was helpful , very. My daughter and I plan to visit Split by ferry from Ancona and have been asking all those questions. The couchettes look more comfortable than I had imagined – I was thinking about a cabin – but I might save us a few euro with a couchette. I do want to ask how long you spent in Split. We will be travelling in December and to avoid losing a day sightseeing (travelling on a day ferry instead of a night one) our options are 2 days of 5 days in Split. Our goal was exploring Diocletian’s palace but if we could find day tours (at a reasonable cost) to Mostar or Salona – we would stay 5. Any ideas would be appreciated. Hi Brian. I know my response is coming very late! I’ve been on a blog hiatus after having my daughter. How was your ferry experience? We were in Split for about 40 days – we were traveling very slowly through Europe and needed to spend some quality time outside of the Schengen Visa Countries (in order to avoid violating the time limit on # of days you can spend in these countries) and Croatia was our place we chose to do that. So we had plenty of time to explore – one day trip we would not want to have missed was to Dubrovnik. It was an easy drive down the coast, although I think we enjoyed it so much because it was February, which is very low season. So we were able to find parking easily and explore without being in the midst of crowds. Did you end up staying for 2 or 5 days? What would you recommend to other travelers? Was there any wifi available on board? Hi Jane! Sorry for my delay responding – I’ve been on a long break from the blog. I unfortunately can’t remember now if they had wifi on the ferry! I did a quick search online and it sounds like the answer is “sometimes”. If anyone reading this knows if there is wifi on the ferries, please leave a comment. Going to do this trip in the reverse. Thanks for the colorful picture! Traveling with a 7 year old, so it sounds like the cabin option is the way to go. Happy travels! Hi Melanie, my wife, Laura, and I will be traveling from Zadar or Split to Ancona in September and have been researching ferry passage. Jadrolinija appears to be the ferry service. We will be traveling on September 15th and thinking that it should be a super busy time. When we go on line to check Jadrolinika’s schedule, they don’t show ANY cabins as an option. Only deck and reclining chairs. Does that seem odd to you? Given the late season traveling, I would think this far in advance, we shouldn’t have trouble getting a cabin. How far in advance did you book and was it during off season, high season or late season?? any assistance you can provide would be greatly appreciated! Hi there John! I am certain my response here is coming too late! Sorry for that – I went on a long blog hiatus after having a baby. How did your travel on the ferry go? 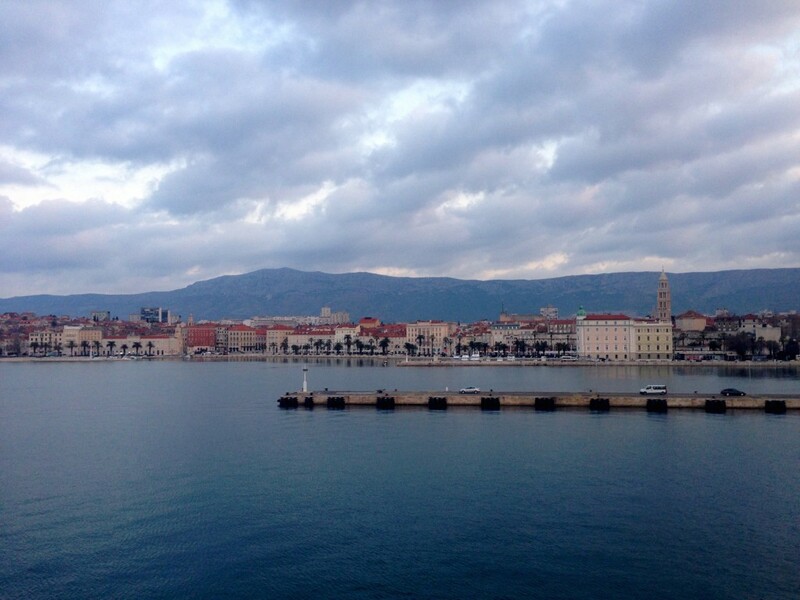 We traveled in low season for sure – it was January when we traveled to Croatia. We booked our ferry passage one month in advance – we booked January 17 for travel on February 20. Hopefully this might help others who come along to this blog page later! I just got this comment and so my comment is probably late. However, when I had an issue with the ferry schedule I wrote an email to Jadrolina Ferry customer service and they responded in a day or two. If you have a question about a cabin I suggest you write them. Hope this helps. Hi Lana! I know this response comes much too late for your trip, but I finally fixed the map! I hope you were able to find your way to the ferry terminal. Happy travels! Hi! Awesome post and super helpful! I am headed there right now actually and hope I am headed to the correct place to claim my tickets. However, the google map does not show up any more. Could you replace it with a photo or something or add addresses of the 3 locations? Thanks! Hi Katie! I finally fixed the map after a long blog hiatus. I hope your trip went okay – were you able to find your way? Is it still as confusing as it was a few years ago? I am going to make this exact trip next week ! I AM SO GLAD I CAME ACROSS THIS POST. I was nervous about the amount of information they are not providing. I am unable to open the map that has the locations of the check in and the ferry. Is there any way you could send this to me directly? Hi there Solei. I’m so sorry that I never responded to your post! I’ve been on a blog hiatus for a couple of years after returning home and starting a family. I know it doesn’t help at this point, but I fixed the map in the post. I’d love to hear how your trip went! Were you able to get checked in and onto your ferry okay? Thank you for sharing this information! I have been looking for insight on the ferry from IT to HR, and this is very helpful. Hello!! Thank you so much because this has been more helpful than the site itself, I am travelling the same route in October except Split > Ancona … when I booked online it only gave me an option for a “Deck Seat” as it said compulsory right after it, since I am travelling alone I’m a bit nervous and have no clue what to expect from a deck seat for 11 hours! I’m trying to contact them to see if I can get an airplane seat or a couchette but having no luck via email OR phone! wondering if you can give a little more advice?! Hi Kaylin! I’m sorry I didn’t respond in time to your question! I’ve been on a super long blog hiatus after returning from travel and having a baby. How did your trip go?! Did you endure the journey in a deck seat?! I know it’s been awhile since you posted this, but I really appreciate it, as I am currently in Split looking to take the ferry over to Ancona at the end of the month. I’m really hoping to end up with a cabin to myself, but we’ll see- I’ll walk down to the Jadrolinija office here in town and chat, as the website still seems a bit spare. If I can end up in an all lady cabin, that would be fine too. Thanks for all the detail, it’s super helpful. Hi! I ended up changing plans- my friend that I was headed to visit in Puglia relocated to Lombardy, so I stayed another month in Croatia and then met up with her in Pula. Hi there I have a unique situation that I am trying to gain more information about. I will be taking this same ferry mid december and I am wondering about the passport control process? Was it a thorough check or very brief? Also thank you so much for all this helpful info… I couldn’t find any other blog or website that gave as much detail as you did and now I know what to expect! Hi there! I’m afraid I am probably responding too late to help you out! It has been a few years now since we went through the passport control process, so things certainly may have changed. I recall it being a fairly brief check, but they examined our passports and stamped them. I read that Croatia may be joining the Schengen visa area soon (https://www.schengenvisainfo.com/croatia-ready-meet-schengen-standards-2018/), so I expect that things will be changing drastically soon. Hi there! I’m probably too late, but yes you can bring on a suitcase! Some people even brought full sized coolers! I’ve read the article and a few of the comments and I hope I’m not making you repeat yourself, but how far in advance did you book the tickets? I’m a big online, in advance type person. We are looking to use the ferry end of September. Hi Olivia, I think we booked a month or two ahead of time. We were traveling in low season and honestly we could’ve booked much closer to our travel dates because the boat had a lot of vacancy. If you’re traveling in high season, I’d book asap. I think someone said that boats fill up quickly during high season. I want to buy tickets before I leave. This was sooooooooooooooo helpful! Thank you! Every question I had and more all answered in this one blog! Thank you! Melanie, we read your blog post as we like so many others were in search of information about the link from train to ferry in Ancona. I read all the replies thanking you and yet not one (that I recall) responded back per your asking. So he I am. We just finished the Camino di Francesco and we’re heading to Split to relax and explore. I found your post for some great info. From the train station, not much has changed. Still no one wanting to provide information. I boarded one bus and attempted to ask direction. It took only two minutes for the driver to throw his hands up in disgust and say “English”. Needless to say I got off his bus. The boards at the station lead you to think it is bus 20. Which are set at 15 minute intervals. We waited, no bus. We walked to the check in spot. No big deal there just one section of about 20’ with overgrown weeds. Sidewalks along the freeway (?). Check in is a breeze. Provided they are there. One was out until four… bus 20 runs back and forth from check in to the ferry. If the check in is “out to lunch”, hop on the 20 and go to town for some food yourself. That driver was very nice and helpful. When your belly is full, hop on the 20 back to the check in spot. Get the idea? That bus goes back and forth all day. Free, no charge no hassle. Check in and ride back and wait for passport check. They only looked at our passports and nothing more! Go out and board the ferry. Ours had a singer and people were dancing the night away! All the while grandma was on the seat trying to sleep! We got a Cabin with two beds so after two bottles of wine it was time for sleep. Oh, if ya don’t have a wine opener, hit the bar. They will open it for you! All in all a pretty smooth trip. Just like the one you recently embarked on! Congratulations on starting your family! Three grown of my own and feeling quite blessed for it. Thank you for your reply! It’s so funny (and also frustrating) to know that this is still such a confusing process for everyone. Maybe it’s part of what makes the journey so memorable? Cheers!